Enerlites unbreakable and undeformable wall plate for Decorator/GFCI outlets, dimmers, sensors, timers, single, and double switches! Enerlites wiring devices line of wall plates are designed and manufactured with high quality material polycarbonate! Enerlites wall plates are one of the best quality of its kind, and meet all applicable standards. Enerlites manufactures their wall plates in all sizes including standard, mid-size and oversize to guarantee that there is a wall plate to fit every device. Enerlites wall plates all feature a sleek, decorative finish and appearance. The screws included with this wall plate are pre-painted ensuring the colors will match perfectly giving it a flush look. 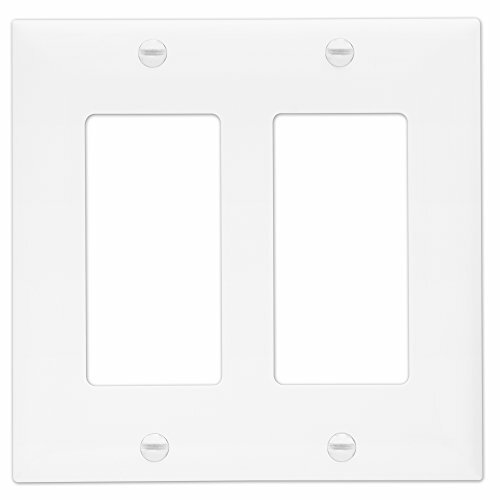 This wall plate is designed to fit all standard size switches, outlet, receptacles, sensors, dimmers and timers perfectly. Unlike many other brands, which use nylon material, Enerlites wall plates are made of an unbreakable polycarbonate material. Nylon wall plates are also unbreakable, but it is easy to bend or twist during installation, transportation or packaging; once it does, it is near impossible to get it back to its original shape. Other wall plates made by popular brands are made of brittle materials making them prone to breakage. Enerlites wall plates are made of polycarbonate, which makes the wall plate very flexible and unbreakable, while still keeping the sleek, smooth look even after installation. Enerlites wall plates are ideal to retrofit any decorator installation for contractors and designers featuring a high quality product at a low cost. With wide choices in color and size, Enerlites offers wall plates in 1 gang, 2 gang, 3 gang, 4 gang and even 5 gang sizes to be the switch cover of choice for toggle switches, double switches and many others. Find your perfect switch cover plate here!